It’s hard to refrain from tapping out the driving, complex rhythm to this lively piece of Bulgarian urban folk music – the Lukovitsko Horo, a dance originating from northern Bulgaria. This performance stems from the mid-20th century sometime, though it’s a little hard to pin down an exact date of release or recording. As I mentioned in a previous post featuring Bulgarian music, in 1947-1948, all the numerous Bulgarian independent labels (a vibrant bunch!) were nationalized by the Communist government and folded into the state-run label known as Radioprom. After a few years, Radioprom became Balkanton – the label featured here. 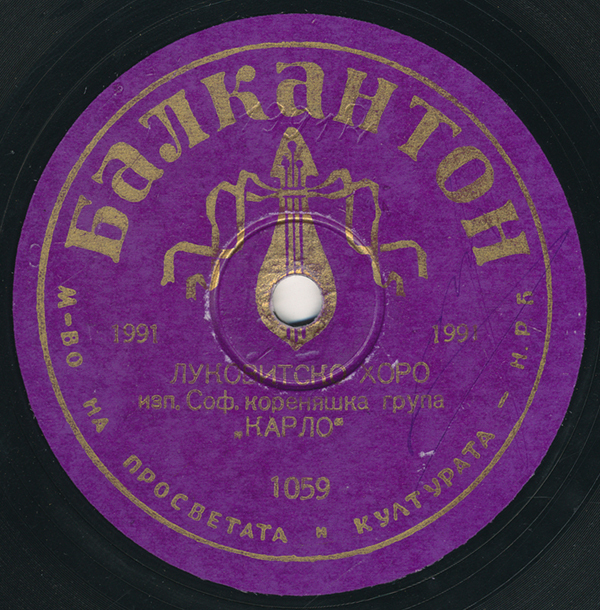 However, both Radioprom AND Balkanton reissued earlier folkloric performances that had been originally issued on those independent labels (as well as a host of nationalistic performances – folk soloists were rare). I know that this record previously appeared on the Radioprom label – I suppose it’s conceivable that it originally appeared, earlier, on one of those lovely independent labels of 1930s Bulgaria: London, Balkan, Mikrophon, Orfei, Arfa…we have not forgotten you! But, enough about label minutiae. Karlo Aliev’s brass band is performing this horo in 9/8 (or daičovo), and he was an important musician in Bulgaria. He was Romani, and was part of a lineage of musicians. Primarily, he was a trumpet player, and his ensemble recorded for numerous Bulgarian labels throughout the 1930s, recording tracks for Orfei, London, and Radioprom. His son, Boris Karlov (1924-1964) was a famed accordion player who began his career playing tambura in his father’s orchestra on Radio Sofia. In fact, Boris was known to later play the flip side of this record by his father, the song Eleno Mome. Boris’ son, Kalcho Karlov, played drums in his grandfather’s band – perhaps even on this track. I was unable to track down the names of the performers, but for other, similar recordings, Karlo’s ensemble featured Demir Cholakov on clarinet, Assen Radenov on violin, and Kalcho Karlov on drums. However, one can distinctly hear the sound of other brass instruments as well (a flugelhorn, maybe? tuba?) on this recording. Bulgarian urban folk featured rhythms and melodies of traditional Bulgarian music, played on non-folkloric instruments. As Lauren Brody points out in her notes to her CD Song of the Crooked Dance (the essential CD collection of Bulgarian 78s available on Yazoo), folk musicians were “quite conversant with non-traditional instruments” and used them frequently in recordings. This is an all-out romp – with some shouts near the end! Much information gleaned from Lauren Brody’s notes, Larry Weiner, David Murray and Peter Jaques. Tricky one to follow for me at least – a fast 9/8 which becomes much simpler to follow about half way through the piece. The only other references to Lukovitsko Horo which I managed to find seem to refer to a much faster 2/4 dance – maybe we have a Bulgarian dance expert who can clarify? Pure magic. That is some band! Not sure if anybody out there is from St. Louis or has ran into an amazing radio show on KDHX, but I thought I might tell people about John Uhlemann’s Music From The Hills. a truly valuable and fun resource for music like this. anyway, just thought I might plug that. Enjoy! Yes, this was originally released on the “Orfei Label” (Orfei 1392), and based on the Catalog number my guess is that the record was originally released around 1942-1944. On the flip side of the Orfei record was another dance tune “Eleno Mome” played by the same band, but this tune was in 7/8 meter.